I've just this week (Jun, 2009) finished this utterly inspiring book by Gerald G. Jampolsky. It's only a small book on the subject of fear but it nevertheless packs a punch, as it shows you how can literally let go of fear via the daily 'love' lessons. 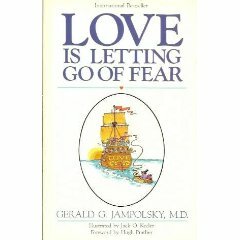 In some ways, Love is Letting Go of Fear is a bit of lightweight version of Guy Finley's book called The Secret of Letting Go. I recommend that you read both of these books. For they talk about the same truth: Love is the opposite of fear, and fear conspires to make victims of us all. I'm not going to explain much more about Gerald's fantastic self help book, as it's so short you might as well just read it (as read my review of it). I will share with you a few of the simple lessons, however, and leave you with the final words of Gerald's book. "Teach only love for that is what you are"
Oh, I will say this, though: One thing I really admire about Gerald G. Jampolsky, is that Gerald uses personal examples of his own fear, and how it still gets the better of him from time to time. And I find this honesty refreshing and reassuring. His examples show me that he has not mastered fear - it is everywhere after all - and that he also needs to constantly remind himself of his own tendencies towards fearfulness. What do you think about Love Is Letting Go of Fear, if you've read it - do let me know! Please comment below. My step-dad gave me his copy he used during recovery over 25 years ago. Every word applies to the divorce I'm going through today. It's a simple read, but so profound. We all have fears and anger and detachment mask fear. My step-dad has passed away since then...but he left me with his wisdom by leaving me this book.